Hello friends! Yesterday was a very happy mail day for me – I got the March My Monthly Hero Kit in the mail and immediately went to my little craft corner play with it. I am currently working on improving my Copic Coloring skills so this kit is more than perfect for me. There is a stamp set with outline florals (plus matching dies) and a bunch of cards designed to be colored (printed on high quality X-Press It paper which is a Copic Friendly paper; I’ve never used it before until now and I have to say I love it, there’s a lot less bleeding when compared to Neenah paper; I am still testing it, but I do like X-Press It paper better so far) and this kit also has a mini version of the Hero Arts Intense Black ink pad which is Copic-friendly. I used the stamps and matching dies to stamp and die cut 3 flowers. I colored them using BG13, BG15 and BG17 along with YR13 for the flower centers. I did add a bit of W05 – warm grey to intensify the darkest color on the petals. The leaves were colored using YG17 and YG67 and outlined using W01 for a little shadow (it doesn’t show on the photo). The flowers were die cut and foam mounted, while the leaves were stamped directly onto the base panel. 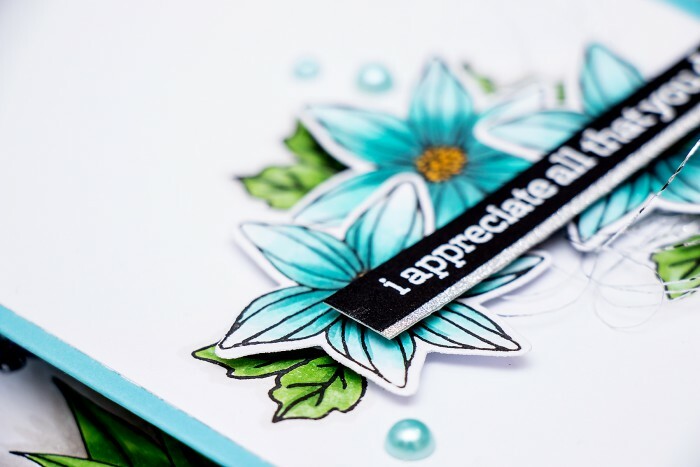 I also heat embossed I Appreciate All the You Do sentiment using white embossing powder onto black cardstock, adhered that onto a silver glitter strip and foam mounted onto the card. 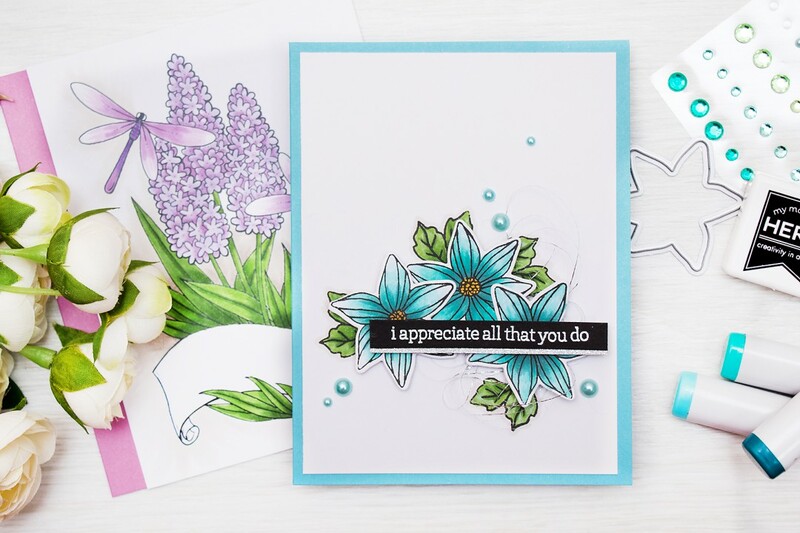 I added a bit of silver thread behind the flowers and embellished my card using a few teal pearls from the kit. The panel was adhered onto the teal card base that was also included in the kit. 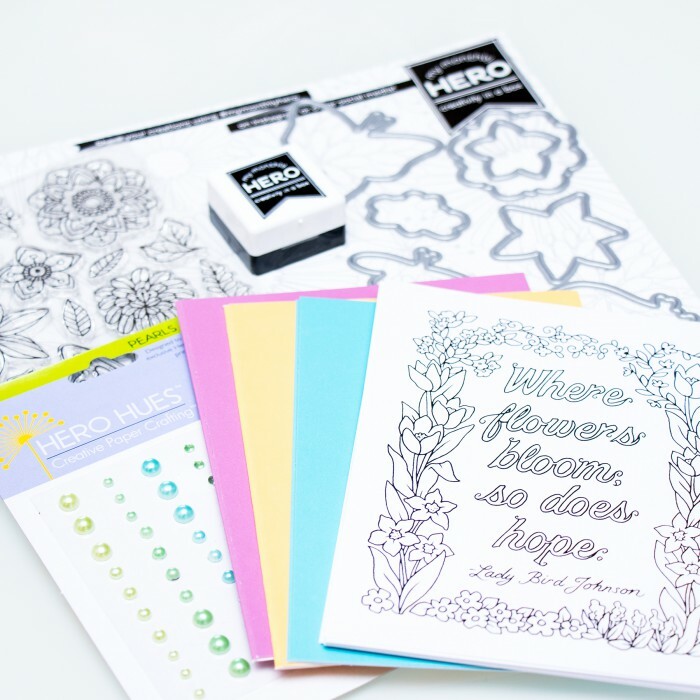 The My Monthly Hero Kit from Hero Arts has limited quantities, so if you want to grab one – do it while its still available. It really is a good one for those who like to color. You can see a lot more samples using this kit on Instagram using the #mymonthlyhero. 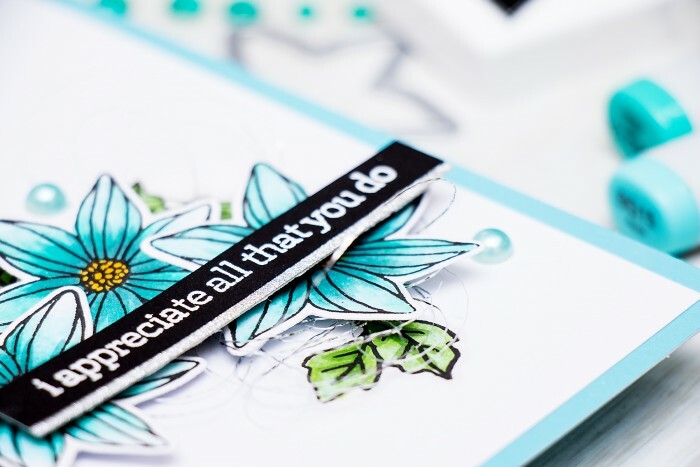 There are also a few add-ons for this kit, like the Marianne’s Flowers stamp set, Ribbon Messages Stamp & Cut set and a Copic Coloring Foundation Book – Flowers. I saw many projects from this set, but this one is my favorite! So beautiful!!! Love bright flowers against the clean and white background. And the black sentiment with silver glitter is a great touch! And these gems reminded me that I have them a lot and can use from time to time instead of beloved sequins and dots.